When too much interstellar conquest is barely enough! "I like it a lot... a remarkably replayable title." 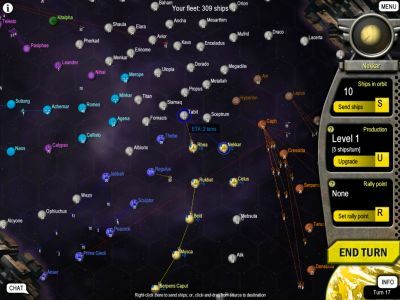 "A fun, easy, and fast-paced turn-based strategy game: 7/8"
"Inventive Dingo's first production - Mayhem Intergalactic - is an enjoyable strategy game for space enthusiasts." "A great creative game with the simplicity of chess and the complexity as well. So far you have done a great job, and it's only getting better." Already bought this? You can download the latest version for free. All customers get free updates for the life of the product. Mayhem Intergalactic is currently available for Windows only. Mac and Linux versions are planned; hang in there, guys! To receive notifications about major new releases - in particular, the release of Mac or Linux versions - sign up for Inventive Dingo's newsletter below. You make the rules. Want to see the enemy coming? Sure! Want to spy on their planets? No problemo. Natives annoying you? Turn them off. Tired of waiting for your ships to charge across the galaxy? Speed them up. Play on randomly-generated maps with custom configurations and sizes (up to several hundred planets! ), choose whether or not to allow factory upgrades, impose turn and time limits, and more. It's your game; play it how you like it. More enemies! Play against up to 7 enemies at once. Are you up to the challenge? More strategy! A variety of hand-crafted maps offer their own special tactics for you to master. Features exclusive to the full version, such as space-time rifts, offer up additional strategic choices. You can even make your own custom maps. Multiplayer mayhem! Challenge your friends to epic sessions of galactic conquest. Internet and LAN play supported. Free updates! Mayhem Intergalactic is regularly updated. These updates are provided free to existing customers. The shopping cart supports Visa, Mastercard, American Express, Discover, JCB, PayPal, check, and money order. Please contact me if you'd like to use a different method. Receive notifications of new releases and special offers by signing up to the newsletter. You will only receive a few messages a year, and I will never ever share your email address or other private information with anyone else.